It is like something from Terminator - technology from the future come to wage war on the present day. Except that, in this case, the conflict is being fought on the pristine fairways and well-groomed greens of the world's best golf courses. As the 70th Masters gets under way at Augusta, golf is battling a problem that could fundamentally change the way the game is played. Put simply, today's professional players are hitting the ball further, and more accurately, than ever before. Why? Improved fitness, better coaching - but mainly, advances in equipment technology. In 1980, the most accurate player on the USPGA Tour made 72.1% of greens in regulation. This year, the leading player is making 76.9%. It is the same story on the European Tour. The best driver in 1999 was averaging 295.4 yards. This year, that figure is up to 322.9 yards. The most accurate player five years ago made 79.7% of greens in regulation. In 2004, the leader is making 82.2%. So what, you might ask. Golfers are getting better. That can only be a good thing. Well, that would be true if golf was a game played only on driving ranges. But it isn't. Today's players are hitting the ball so far that those courses are in danger of being rendered obsolete. So what can be done? Well, either you do something about the equipment that is powering the ball down the fairway, or about the fairways themselves. This week's Masters is taking place on a very different course to that originally designed by Bobby Jones and Cliff Roberts 70 years ago. Two years ago, half the holes were altered, with the overall length of the course being increased by almost 300 yards and a number of tees being repositioned. But, say traditionalists, the course has now lost much of its intrinsic charm. The back nine is now so different that we are unlikely to witness the sort of tournament-winning late charge that won Jack Nicklaus his last green jacket in 1986. The issue is even simpler elsewhere. There isn't the room to extend tees at many courses. And if you do, and players continue to drive further, what then? Nicklaus is one of several players who insist that club and ball technology must be reined in. "It's absurd," he says. "You have to restrict the ball. The game gets ruined. 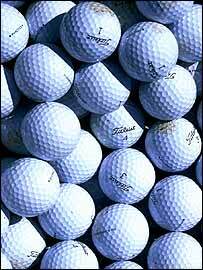 It makes absolutely no sense whatsoever to allow the golf ball to do what it is doing." Arnold Palmer, who is playing his 50th Masters this week, agrees. "The ball needs to be slowed down, rather than continuing to try make the golf courses longer and longer," he says. "If you don't slow it down, as time goes on, the problem is going to become more severe." The problem with that solution is that you would then have the professionals using different equipment to amateur players. The game's rule-makers, the Royal and Ancient, maintain that having universal rules governing both amateurs and pros is one of the central tenets of the game. At least in theory, any player in the world can compare themselves to the very best by using the same clubs and ball and playing the same course. No matter that the average hacker is unlikely to own a top-of-the-range set of clubs or ever play the Old Course at St Andrews, let alone Augusta. The principle is there. The big equipment manufacturers like Callaway disagree. They say that people taking up the sport, older players or just golfers who play for fun should be given every help they can. If being able to use a more forgiving driver or a ball that flies further brings more people to the game, they say, it can only be a good thing. Of course, when your business is worth millions of pounds a year, it is in your interest to keep putting out new products and having people buy them, rather than seeing them banned - as was the fate of Callaway's ERC II driver. Will the game's governors take a stand against the might of the manufacturers, or will players soon be driving the ball 350 yards with balls that could fly to the moon if you hit them well? Interestingly, the R&A issued a statement which "deplored that players, instead of trying to master the use of golf clubs, should endeavour to overcome difficulties of the game by using implements which have never been associated with it". That was in 1924. This is one battle that shows no sign of drawing to a close.